Each project, event or show is specific to the individual client. 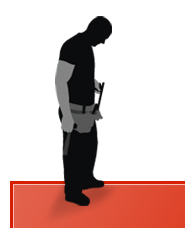 We adapt our services to meet your requirements, especially in these difficult times. We focus on an economical approach to all events and provide cost effective solutions no matter how big your project is. 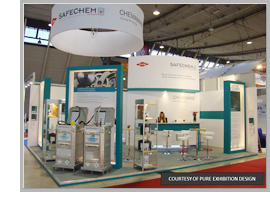 A purpose made stand constructed and installed in Stuttgart and London, designed by Pure Exhibitions and built by ourselves. Required for a two year programme. 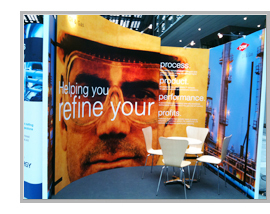 Requirement was to create an impact for a shell scheme stand by using a platform with high full graphic walls. We were able to create a very effective shell scheme stand. We have since re-used graphics on separate occasions and with our economical approach, we have enabled the client to add to their list of shows for the forthcoming year. 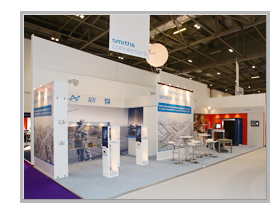 Currently we hold all of the central marketing exhibition materials including the group stand and portable displays for all of Atkins PLC. As and when individual business units require materials we distribute accordingly, we dispatch materials as required and on occasions we will install at various venues. The stand and materials are all held in our store, we create an inventory and portfolio of graphics and these are all available to view on the Atkins internal intranet site. Every item is checked on return. By controlling all materials in this way we can adapt and re-use items for each individual business which affects cost savings for the whole group. 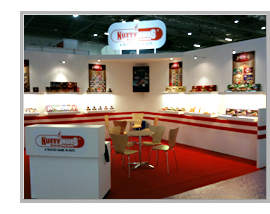 Our most recent stand designed and created by ourselves. 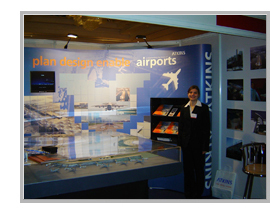 Our client is based in Dubai and required a stand for the IFE show, Excel, London. Although a simple design, it was effective and met the client's needs. We were humbled to be trusted with the design and build from a client that was new to ourselves. An example of our current program - for the Villeroy and Boch outlet refurbishments, throughout the UK and Ireland. 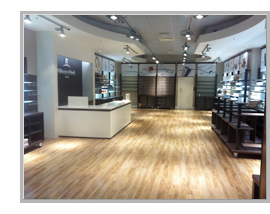 Dilapidation works undertaken where required, all new shop fixtures as supplied by Villeroy and Boch Germany. All other aspects of construction and fit-out supplied by Graham Rowland.